What went wrong? How did so many talented people devote their time and energy to a film that came out this generic, dull, and flat? Director Amy Berg certainly knows a thing or two about warped perversions of human need as proven by her work directing documentaries like “Deliver Us From Evil” and “West of Memphis.” And screenwriter Nicole Holofcener has been one of the best in her field with gems like “Lovely and Amazing” and “Enough Said.” Perhaps neither was quite suited for this material as Berg’s skill with non-fiction doesn’t translate to her first narrative film and Holofcener’s gifts with character are smothered by the twisting and turning requirements of airport bookstore thriller fiction. 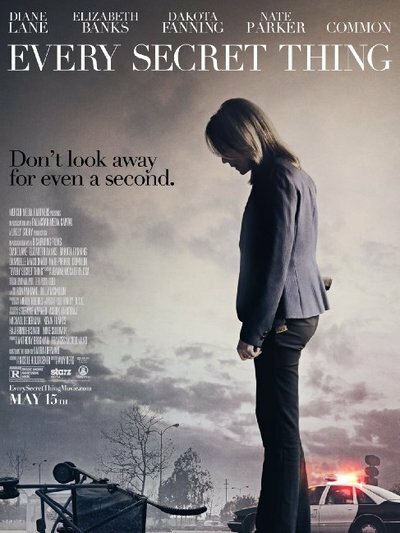 Whatever the case, “Every Secret Thing” is a misfire on multiple levels, only slightly redeemed by yet another good performance from a Fanning and some strong supporting work on the fringe of this cautionary tale. Seven years ago, Ronnie Fuller (Dakota Fanning) and Alice Manning (Danielle Macdonald) were convicted of kidnapping and killing a baby girl who was grabbed from her porch in broad daylight. Both pointed the finger at the other one, and both were sent to juvenile detention for their formative years. Two weeks after Fuller and Manning are released back into the real world, a 3-year-old girl is snatched from a furniture store in the middle of the day, as her parents (including Common) shop for a new mattress. Did Ronnie or Alice repeat the crime from their youth? Detective Nancy Porter (Elizabeth Banks), who, of course, is the same cop who found the body in the first case, is called in on the second one, partnered with a gruffer fellow detective (Nate Parker), and on the urgent hunt for answers. Sort of. One of the many dramatic ingredients lacking from “Every Secret Thing” is a sense of urgency. Say what you will about the histrionics of something like “Prisoners,” I far prefer that to the lackadaisical approach here, in which Banks is forced to occasionally spit out lines about how they’re looking for a toddler who may already be dead but the filmmaking never matches the intensity of the situation. The reason “Every Secret Thing” lacks intensity is because Holofcener and Berg forgot to craft real characters. Every single person in this film is a cog in the thriller machine, and most of their dialogue merely pushes the mystery forward. There’s something buried deep within this narrative about bad parenting—Ronnie’s are essentially absent while Alice’s mom, played by Diane Lane, is simply a horrible person, berating her overweight daughter in scenes of domestic awfulness that feel overly scripted, under-directed, and just false. Worst of all, Macdonald is forced to carry much of the dramatic weight of the second half of “Every Secret Thing” and she proves incapable of doing so. Only Fanning (and Common in a few scenes) seem well-cast and engaged by the script. Everyone else varies from mediocre to awful. How do bad movies happen? It’s clear that “Every Secret Thing” was made with good intentions. It certainly doesn’t feel like it fell off a Hollywood movie assembly line. Again, it may have been a project that simply didn’t play to the skills of its director or screenwriter, and no one was willing to admit that given the success they had found in the past. Everyone will come out of this unscathed. Berg already has a new doc making waves and Holofcener isn’t going anywhere. Banks, Lane, Fanning—they’ll be in great films again. In fact, it may be best for everyone involved if “Every Secret Thing” stays between only a select few viewers.